We recently attended the Vintage Grand Prix events in Watkins Glen, New York which, as always, was a great event that played host to hundreds of fantastic classic and sports cars. That, however, is another story but while in the area for the weekend we discovered a different sort of vehicular assemblage. According to the hand-painted sign affixed to the accompanying roadside shanty, this eclectic accumulation of mostly European rusty sheet-metal is a “used car dealer.” That seems to be a rather dubious claim though. 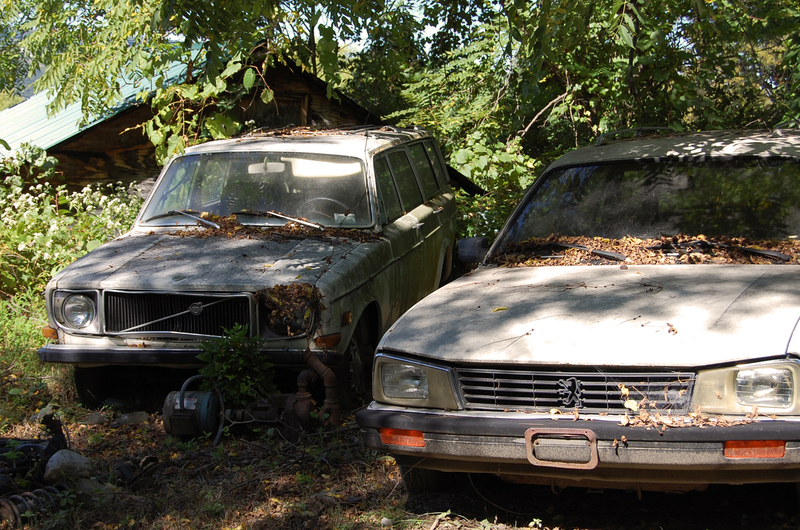 It can’t exactly be described as a “junkyard” as such either because the majority of these cars are mostly complete. Whatever the case may be, this automotive cemetery is quite fascinating though it is likely local residents don’t share the feeling. The whole establishment almost has an air of abandonment about it, though a couple of relatively new cars and the fairly shiny Pontiac Vibe out front suggests some signs of life somewhere. 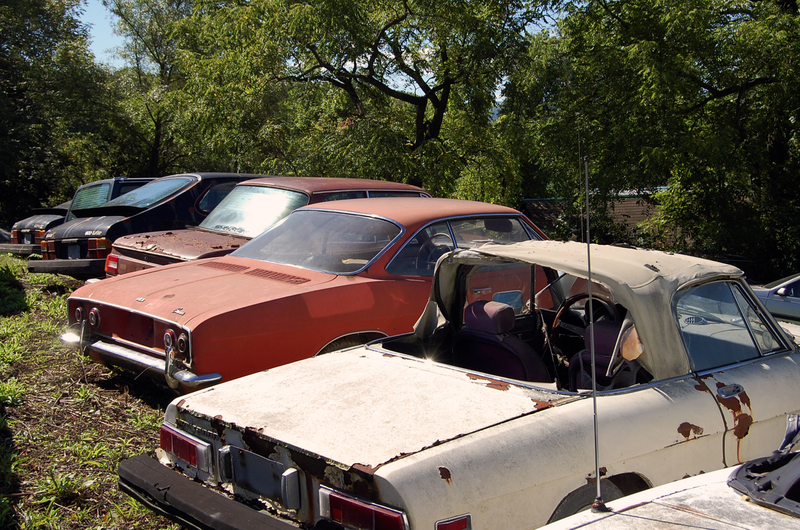 Certainly most of these cars have not moved in decades and have been subjected to years of weathering on a hill. One Chevrolet Corvair had actually become a greenhouse to the vines growing up through what was once the floor. Swedish cars seem to hold a majority stake, with Volvos being the most prevalent. There are also several Peugeots, a few BMWs, some Alfa-Romeos and Fiats, and a lone Rover, among other assorted brands. These photos still do not show the full scale of the hoard. There’s more to be discovered further up the incline though accessibility was limited. Some mechanical work appears to have taken place on the premises as well. This seems evident by the garage located up the steep dirt driveway, dozens of 5-gallon buckets presumably filled with used fluids, and a Volvo P1800 completely burred in old exhaust systems. 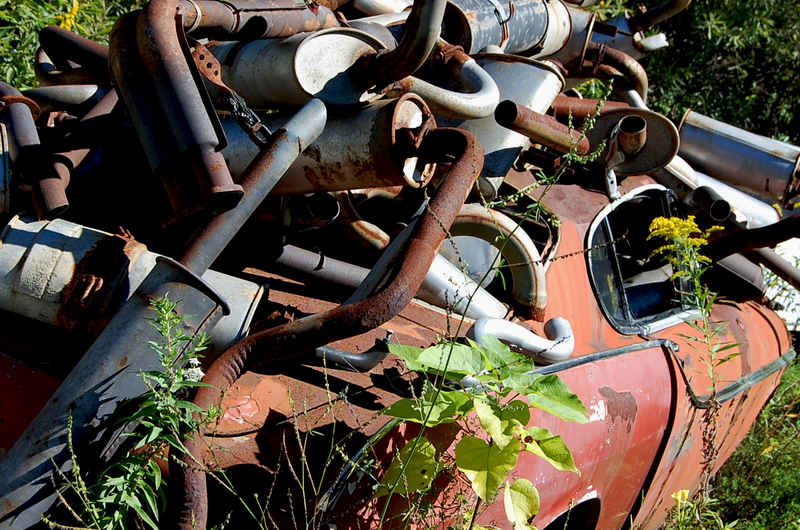 As these vehicles slowly decompose back to the basic elements from which they were constructed, they quietly overlook the tip of Seneca Lake towards the village of Watkins Glen where motor vehicles have made history for over 60 years. is there any contact information that you can post/provide? Superb albeit sad photos – and a nice turn of phrase Ian. The alfa sedan: model designation? California plates, scrapped in New York; every car has a story. I visited this spot 2010.